The biggest new feature announced for Fallout 4 is the ability to build items using parts scavenged from the detritus littered around the world. As well as building weapons and components for your armour, you’ll be able to create your own settlements in various places around the world. 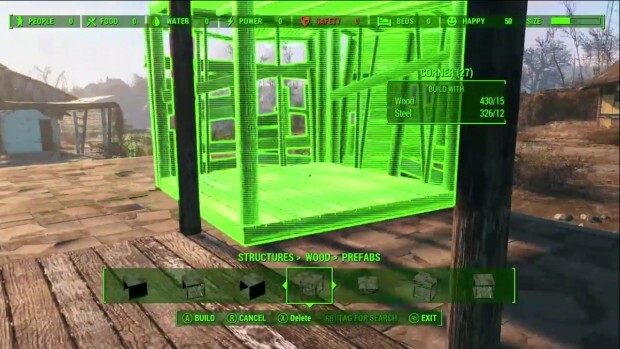 You can place walls, modular prefabricated building elements, furniture, defensive items and more, wherever you want within the settlement zone. Bethesda have now made their E3 conference Fallout 4 demo video available online. The building section starts at 23:20. As the settlement gets bigger, you’ll find that traders and settlers will arrive. Build stores for them to use or create gardens for them to grow crops. With the right resources, you can also build power generators, connecting them to objects like control terminals. Control terminals will allow you to play with various object settings like the colour of light panels that you’ve connected. Your settlements will be besieged by NPC raiders, so you’ll have to build turrets and other forms of defense. Settlements are entirely optional, so if you don’t like that sort of thing, don’t even bother with it. As for me, I’m really looking forward to building a bunch of my own distinct little towns around the map. More from E3 2015 here.